Inside slider slid right down the eastern Sierra and is bringing more cold air with it. You were warned. Tonight should be very cold. 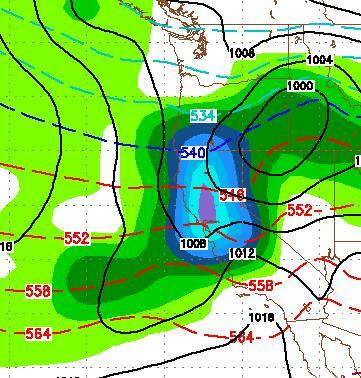 A giant ridge of high pressue will move into our area tomorrow and will not be moved until Monday or Tuesday of next week. This will bring a gradual warming trend with highs in the upper 50's by early next week. If these weather predictions hold true, there are a series of storms that should follow this big one.